A true breakthrough in high-speed Time Measurement and test technology, GuideTech’s GT667 leverages the power of its continuous time-stamping technology, eliminating the need for supplemental triggers, pattern markers or clock recovery circuits. GuideTech’s CTIAs enables serial interfaces pattern verification and full jitter analysis in milliseconds for fast, automated characterization and high-throughput production test on all ATE platforms, including low-cost and in-house testers. Has high accuracy 10MHz time-base with NIST traceable calibration, enabling high-precision optimal test at lower cost. 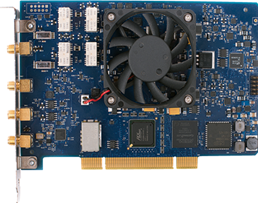 GT667 PXI & PXIe cards can be expanded up to 34 Channels Single Ended Input in a single 3U GT8000 PXI and/or PXIe chassis. Some of the GT667 measurements include Time Interval Error, 1 PPS Monitoring, Jitter measurements, PLL & Clock Jitter, Spread Spectrum Modulation, PLL Lock Time, Frequency, Period, Pulse Width, Skew, Tpd, Rise/Fall Time, and more.